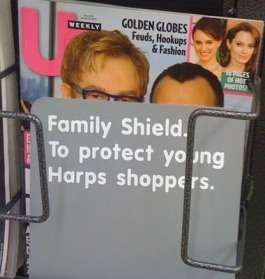 A grocery store in Arkansas put a "family shield" (sounds to me a like a euphemism for birth control) over the Us Weekly magazine cover where Elton John and David Furnish debut little Zachary. Wow. It doesn't really surprise me that this happened in Arkansas, but it does make me angry. I wasn't aware that a gay couple being photographed with their newborn son was indecent or offensive...heaven forbid that a child see a gay family. Who gets to censor some families over others? Should Kate Gosselin's magazine covers be censored because she is a single mother? Should they cover up the magazine displaying Kate Hudson's baby bump because she is unmarried and pregnant (gasp)? What about interracial relationships? Polygamists? Apparently, the grocery chain, Harps, censored the cover because the store had received customer complaints. Harps claims that censorship of the magazine is in no way the store's opinion on the issue. Interesting. I bet my bottom dollar that the magazine cover of Jesse James adorned in Nazi garb was NOT censored -- I'm sure it received NO complaints by concerned shoppers in this particular pocket of our great country. After being called out by the media and gay rights activists and supporters (there was a boycott called for against the chain), Harps has taken down the family shield. I wish I had a shield to protect others from this kind of ignorance. kudos for using the word ginormous, definitely appropriate here . . .